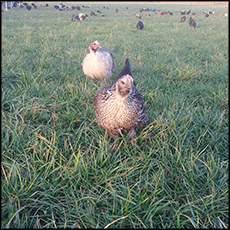 Humanely raised on chemical free pastures, our free range chickens forage all day without cages, pens or chicken tractors. All of our poultry is fed certified organic feed and remains free of hormones, antibiotics, medications, pesticides or herbicides. Our great tasting and healthy chicken is high in vitamin D, Omega 3 fatty acids and other nutrients and minerals. We raise lively, healthy chickens that can run, jump, play and forage — unlike the Cornish cross hybrid chickens that are sold in the stores that can’t even walk! Our chickens take two and half times as long as commercial chickens to grow to full size, have normal size breast meat, and make much healthier and tastier chicken. Average dressed weight for our chickens ranges between 3 to 7 lbs. You can get them as whole chickens or cut into eight pieces. They are vacuum sealed one bird per bag and will be frozen when you pick them up. When comparing prices, keep in mind that store bought chicken is injected with saline to get the weight up. About 15% of the weight you pay for is added water. Click here to order online. Most people don’t care what they eat as long as it’s cheap. When it comes to meat, there is no better example of this than chicken. For the first time since they’ve kept a record of it, people are eating more chicken than beef, pork or turkey and the main reason is because it has become so inexpensive. We need to stop asking why real food is so expensive and start asking why conventional food, especially chicken, is so cheap. In the United States, all commercially grown chicken comes from Cornish cross hybrid chickens. This includes organic, free range, cage free, humanely raised, pasture raised and locally grown. They are all the same breed of hybrid chicken that can’t even walk! The Cornish cross chicken (a.k.a. broilers, fryers, jumbo cornish rocks, cornish x) is so hybridized that they’ll be full grown in six weeks and can’t be allowed to live much past that because they’ll die of liver and heart failure due to their insanely fast growth rate. These chickens, raised from a proprietary breeding process, have unnaturally large breasts, grow extraordinarily fast, and a very high feed to weight conversion making them incredible inexpensive to raise. Even locally raised pastured chicken is this same hybrid chicken. 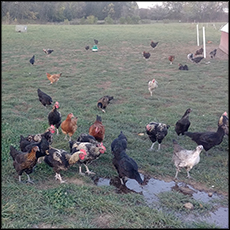 The difference is that pasture raised chickens are outside, usually in small chicken pens (called ‘tractors’) instead of inside large barns. The chicken tractors are sometimes moved once a day to a new spot on the pasture which is supposed to allow the birds to forage on fresh ground. But, the Cornish cross hybrid won’t forage well if at all because the ability to forage has been bred out and their large size inhibits any mobility. Since they are out of a barn and on green grass this is a step in the right direction but they are still the same unhealthy hybrid chicken that can’t walk. Modern hybrid meat chickens are unhealthy because of their genetics. Meat from obese, immunocompromised birds that were taken to slaughter just before they were to die of heart and liver failure cannot be good for you! Just because you buy organic ‘humanely raised’ chicken in the store doesn’t mean the birds are raised on pasture or get sunlight or anything else but the inside of an enclosed barn. The organic regulations say that organic raised birds must have access to the outdoors but for most organic producers ‘outdoor access”’ means a very small space out a small door that’s open a few minutes a day if it even exists at all. The conditions and birds from organic factory farms are not any different from the conventional factory farms. Most organic chickens that are sold in stores never see the light of day with hundreds of thousands of Cornish cross chickens in very small spaces. Recently, in California, a new regulation was passed that requires egg producers to provide 116 square inches of space for each hen, just enough where they can stretch their wings. That’s a space smaller than the size of a legal sheet of paper and producers can’t meet this requirement! Meat birds are usually provided even less space, about 96 sq in, which is about the size of a standard sheet of notebook paper. We won’t raise Cornish cross chickens — even though it means we cannot sell as many chickens because of the cost associated with growing other breeds. We could easily make much more raising Cornish chickens that can’t walk. Instead, we raise chickens that can forage so that they get a healthy diet and make healthy chicken. They run, jump, play, and act like chickens! And, they look like chickens too! 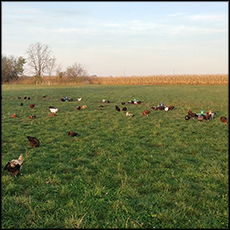 Our chickens dig in the dirt, forage for bugs and seeds, peck at the grass, eat plants, etc. They are lively, healthy chickens. Their forage is supplemented with locally grown Certified Organic Feed which has poultry minerals added. Our chickens can live for years as healthy normal chickens. Our chickens don’t get nearly as big as standard hybrid meat chickens, take two and half times longer to grow to full size, have much more normal size breast meat, and make much healthier and tastier chicken. Like with everything we raise healthy animals make healthy meat! They also have significantly higher levels of vitamins (particularly D & E), minerals, and a much better Omega 6:3 ratio. Average dressed weight for our chickens ranges between 3 to 7 lbs. You can get them as whole chickens or cut into eight pieces. They are vacuum sealed one bird per bag and will be frozen when you pick them up. When comparing prices, keep in mind that store bought chicken is injected with saline to get the weight up. About 15% of the weight you pay for is added water.